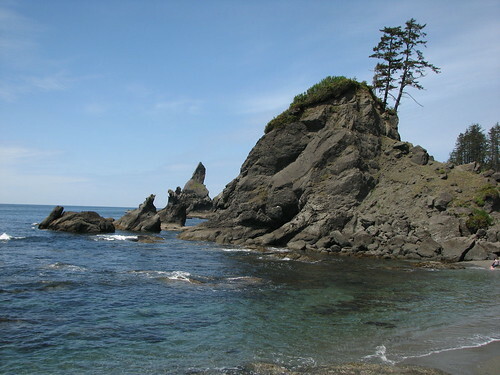 Shi Shi Beach, a photo by Southworth Sailor on Flickr. This year's trip to Neah Bay with our fifth graders did not get off to a good start. I arrived at school at 6am and a student showed up at the last minute with no permission slip signed. Luckily, we were able to get a hold of dad to come to school and sign it. Then there was a driver who showed up late. While dealing with these issues, I sent a dad to the gas station to pump up one of my truck tires since it looked a little low. When he got back we could hear the air leaking and found a screw in the tire. Fortunately, another dad had a fifteen passenger van that was basically empty, so we piled all the supplies into his van and I rode with him. Thinking the drama was finished for the morning, we made our first rest stop and we got a phone call from a frantic mom who I had neglected to rendervous with in Silverdale. One of the drivers went back to pick the boy up while the rest of the nine vehicles kept going. I was starting to think that this was going to be a disastrous trip; but once we got to Neah Bay, things went very well, and despite some rain as we packed up to leave, it was a great time. While I was at Neah Bay, Esther was with the Eides in Oregon, celebrating Marika's graduation from Canyon View Equestrian College.